I’ve had a chance to view and play around with the recently released “new” iPad. What Apple says about the Retina display is definitely true. My eyes, which have perfect non-corrected vision, can not discern the pixels. Text looks absolutely as sharp as a printed page and everything else is noticeably sharper across the board. There is no doubt Apple is going to sell an astronomical number of new iPads, but the question is which model will be the biggest seller? 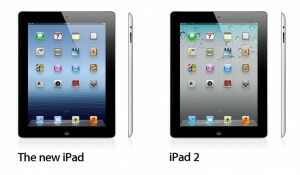 Because as Apple as introduced the new iPad at the same price points as the previous two iPad models, they have kept the previous model iPad 2 around at 16 GB capacities, but have lowered the price $100. As amazing as the new iPad’s display is, the practical matter is that the iPad 2’s display is more than plenty capable for just about any purpose. Even as I had an iPad 2 and a new iPad side-by-side comparing the difference, I had to concede that the differences were simply not that great from a very pragmatic viewpoint. If $100 makes the difference between having an iPad vs. not having an iPad, then I could not argue against getting the iPad 2 at its new price point. About the only caveat I would make is for the purposes of reading. If someone is planning to buy an iPad for heavy use as an e-reader, I think the extra $100 is worth it. And maybe photographers or creative professionals would appreciate the extra resolution. But for average use, the extra $100 isn’t worth it if it makes or breaks the purchase. It is entirely conceivable that the new lower price of the iPad 2 16 GB models will spur growth of the iPad into more price-conscious markets. Just how large that growth will be is yet to be seen. But it is possible that while the new iPad will garner all the headlines for months to come, when all is said and done the biggest impact on the technology market may come from the iPad 2.